tbsp toasted Waitrose LOVE Life Pine Kernels. Place the garlic in a mini chopper with the basil leaves (you may need to do 2 batches to fit in all the basil), lemon zest and a handful of cheese. Whizz until finely chopped then add the olive oil and whizz again to make the pesto paste. Season and add a pinch of dried chilli flakes (optional). Cook the tortelloni in a large pan of boiling water for 2-3 minutes until tender – keep the heat on a gentle simmer. 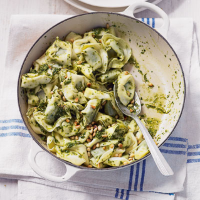 Drain the pasta and toss with the pesto and the toasted pine kernels.